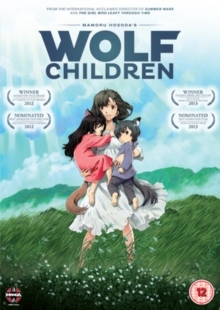 Mamoru Hosoda directs this Japanese anime feature following the growth and development of a pair of wolf children. Hana (voice of Aoi Miyazaki) meets and falls in love with the dashing Kare (Takao Ohsawa) when he helps sneak her into a college class. Little does Hana know that Kare is a werewolf, but she loves him for who he is and is undeterred when he reveals his true identity to her. They have two children together, Yuki (Haru Kuroki) and Arne (Yukito Nishii), but their hopes of a happy future together are dashed when a tragic accident takes Kare's life. Left with two temperamental children to raise - both of whom possess the ability to switch between human and wolf form at will - Hana faces a daunting challenge as she seeks to navigate Yuki and Arne safely through childhood and adolescence.